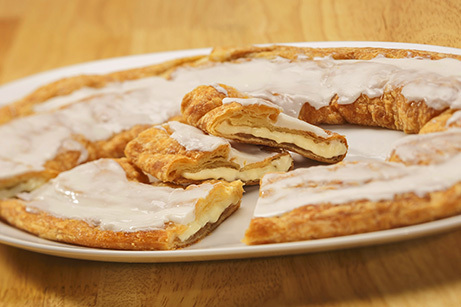 Two greats in one - Kringle and cheesecake! 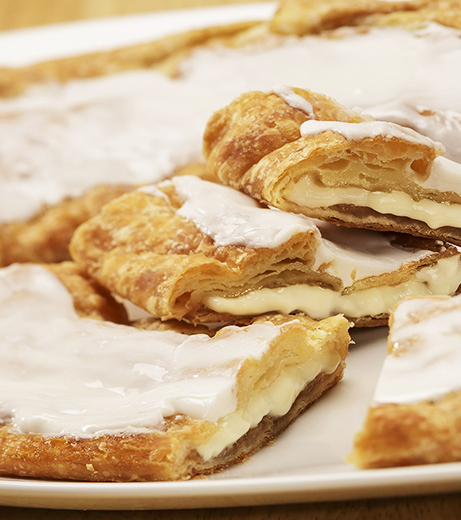 This Kringle is filled with delicious cream cheese and a subtle graham filling. 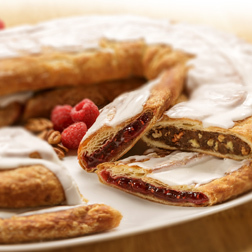 If you like New York cheesecake, you'll love this Kringle! Sugar, Wheat Flour, Margarine (Interesterified Soybean Oil, Water, Salt, Mono- and Diglycerides, Colored with Annatto/Turmeric. Calcium Disodium EDTA added as a preservative. Artificial Butter Flavor. Vitamin A Palmitate added. ), Corn Syrup, Eggs, 2% Or Less of the Following: Whole Wheat Flour, Maltodextrin, Cream Cheese (Pastuerized Milk and Cream, Cheese Cultures, Salt, Xanthan, Locust Bean and Guar Gums), High Fructose Corn Syrup, Modified Food Starch, Soy Protein, Soy Lecithin, Yeast, Dextrose, Agar Agar, Benzoic Acid, Lactic Acid, Palm Oil, Canola Oil, Soybean Oil, Polysobate 60, Potassium Sorbate Preservative, Calcium Carbonate, Natural & Artificial Flavors, Tocopherols Preservative, Calcium Propionate (Preservative), Baking Soda, Malted Barley Flour, Corn Starch, Honey, Color Added.